15 years hence in “Google” of the changes in Sabarimala !!! 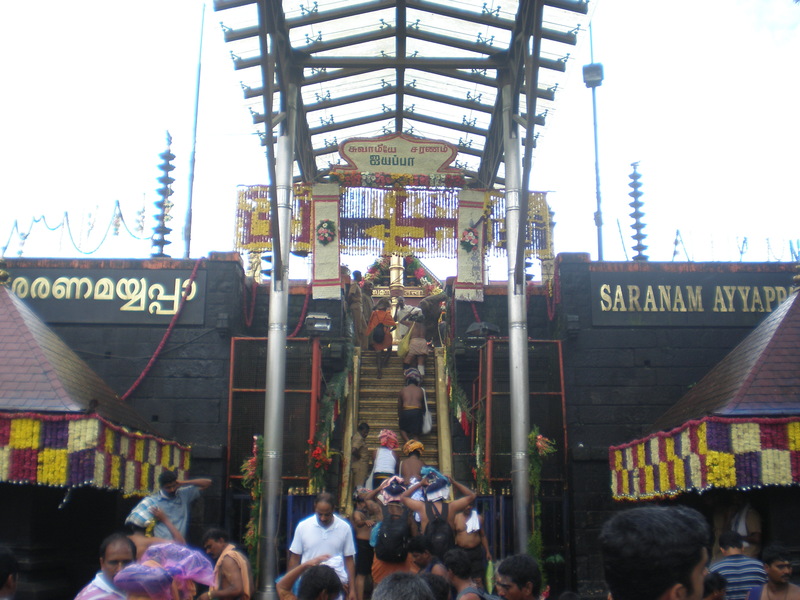 It is exactly 15 years since I last visited ‘Sabarimala’ – a temple housed in the hills in the southern state of Kerala which is supposed to be “God’s own country“. Those days, if I had to provide information on this temple, I would have had to spend time and energy to write a few lines coherently and still may end up not providing the full or proper information. But today, times have changed. Without me prompting, one would just “Google” ‘Sabarimala’ and find for oneself all relevant and even irrelevant information he/ she needs. As “Google” celebrates its 15 year anniversary this week, I realized that 15 years is a long enough period to witness paradigm shifts. We have been fortunate to be a part of many disruptive technologies in our lives – “Google” being certainly one for changing our lives for the good. 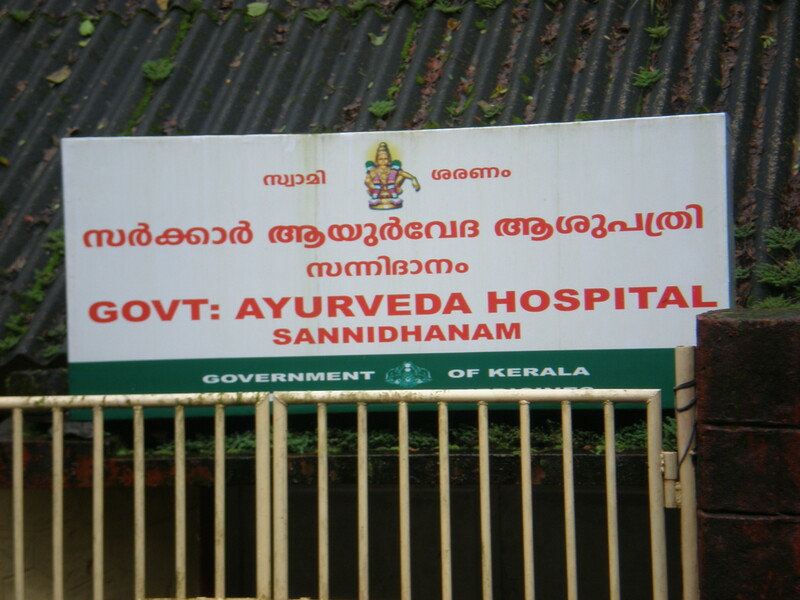 As I embarked on the Sabarimala trip last week, I was keen to look out for the changes – good and otherwise that would have happened, for myself. For people who have been regulars it might have missed their attention and may not be so exciting but for me it clearly gave a “Before/After” picture which I thought I will share in this post. 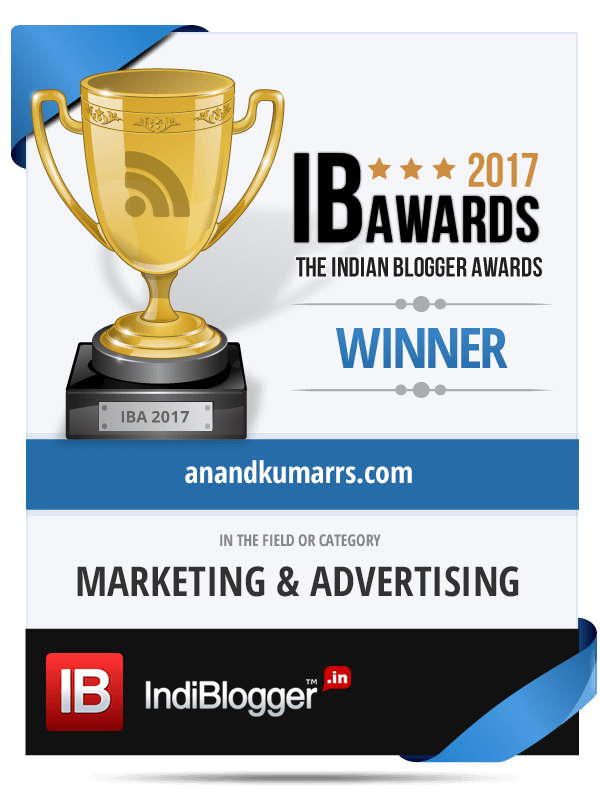 And my focus of this post is just on those interesting changes which I managed to capture. 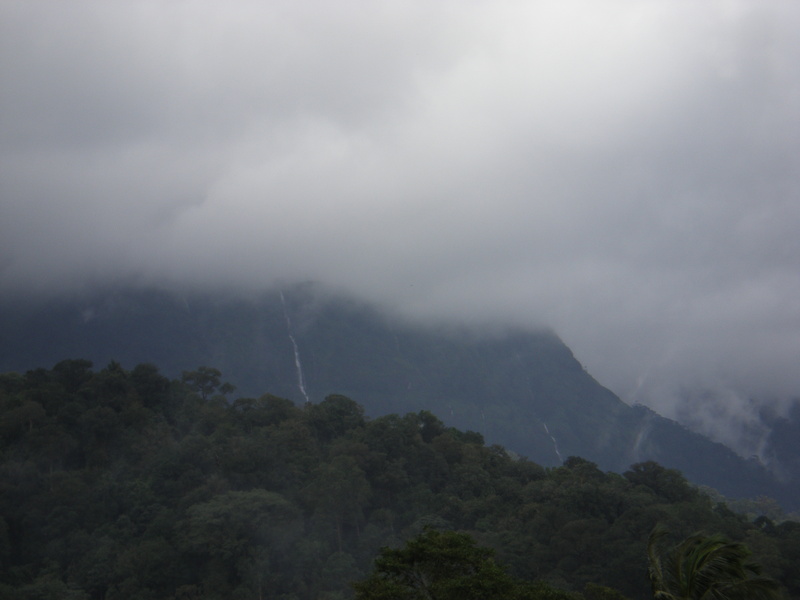 The highway leading to Pamba the base camp from where you start trekking up to the temple is part of the Ghat section and is forest area. One could now see the highway “littered” with signs of “No plastic zone” in line with the increasing concerns around protecting the environment these days. 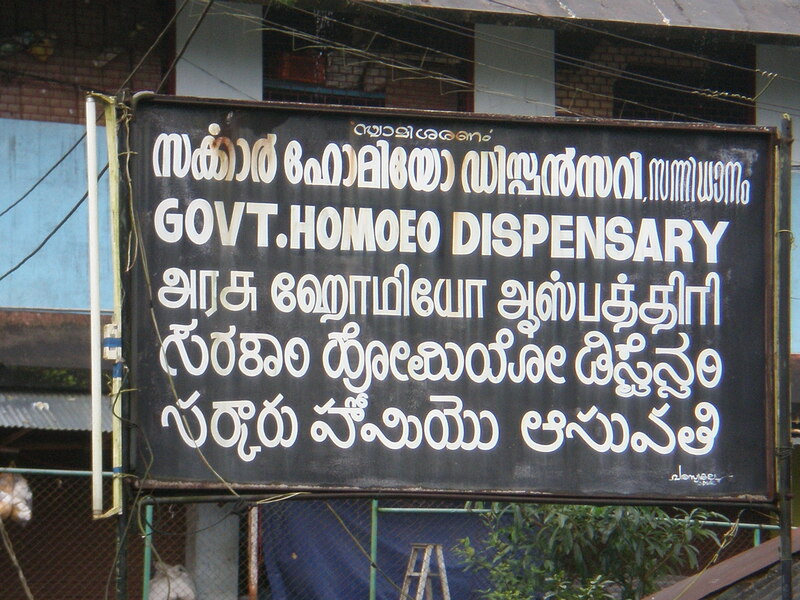 But the irony was not lost on us as soon as we reached Pamba and alighted out of the car. It started raining and you guess what – “plastic” sheets were being hawked for 20 bucks as rain covers to protect you from the rain as you climb!!! In the “Plastic free zone” – plastic was freely made available!!! You could see the effects of the other “disruptive technology” as soon as you land at Pamba now. At Pamba most of the public utility and services buildings like the post office, police station,.. are all now crowned with “Cell phone” towers which means that we cannot give the excuse of “no connectivity” for not attending to our business! Ofcourse if your operator was for example Airtel you can still get away!!! The once busy STD/ISD/PCO booths now witness in envy the mini stampedes in Mobile recharge shops as people scramble to get their SIM cards topped up. At the Pamba base camp one cannot the miss now the ATMs of various banks solving the liquidity issues of the pilgrims. And if you want to do last-minute changes in your travel plans or do some booking, Southern Railway has pitched in with a railway reservation counter. The hilly steep terrain from Pamba to ‘Sannidhanam’ (Sanctum Sanctorum) which used to be just muddy/rocky path interspersed with logs of wood to provide grip has now been concretized. I am not sure if this is good or bad. 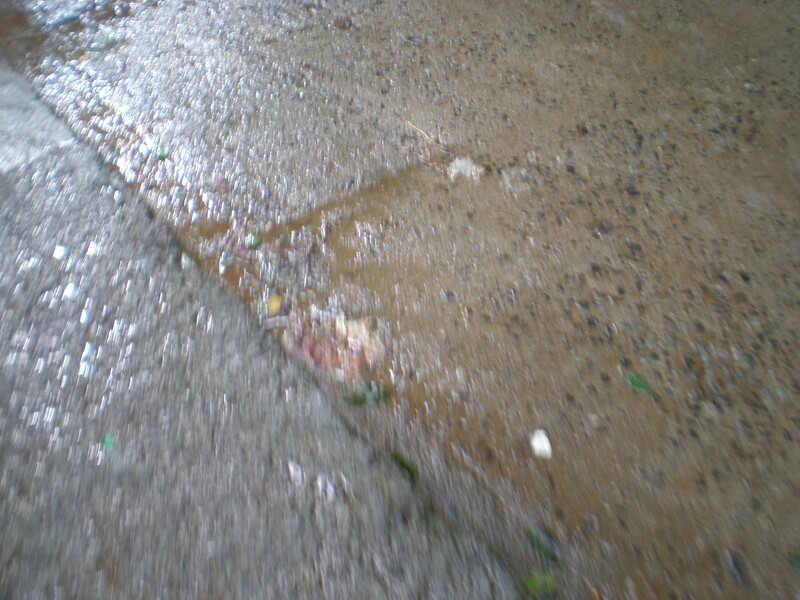 Ofcourse it provides more grip while climbing up and coming down but during afternoons the concrete path heats up. Also the not so smooth but rough concrete surface provides for a nice acupressure treatment!!! It is now advised to climb with your slippers on. The concrete surface also means – it is now possible for the vehicles to move up and down which was an unseen sight those days but a common sight now. 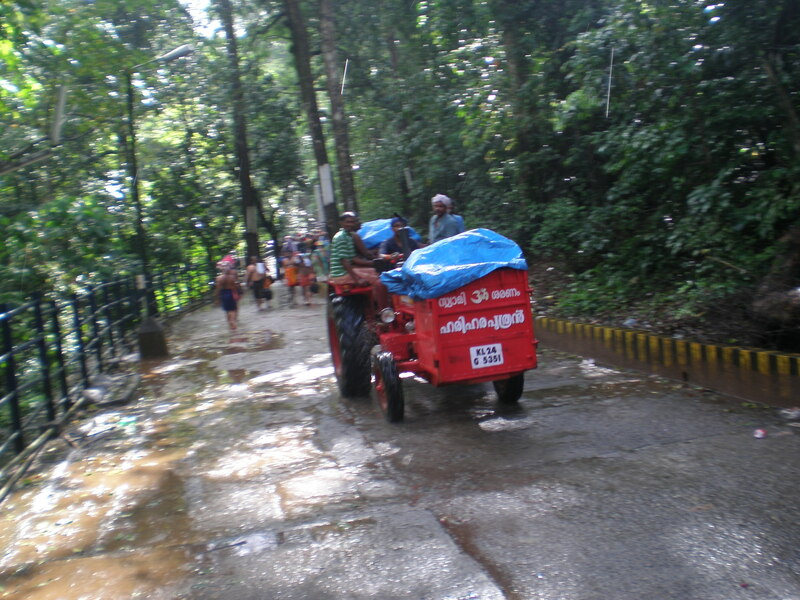 The Mahindra tractor keeps whizzing past you up and down now carrying loads of material required at the top. But they are well advised to “HORN OK PLEASE” 🙂 🙂 Actually herds of donkeys were doing the material carrying routine those days. 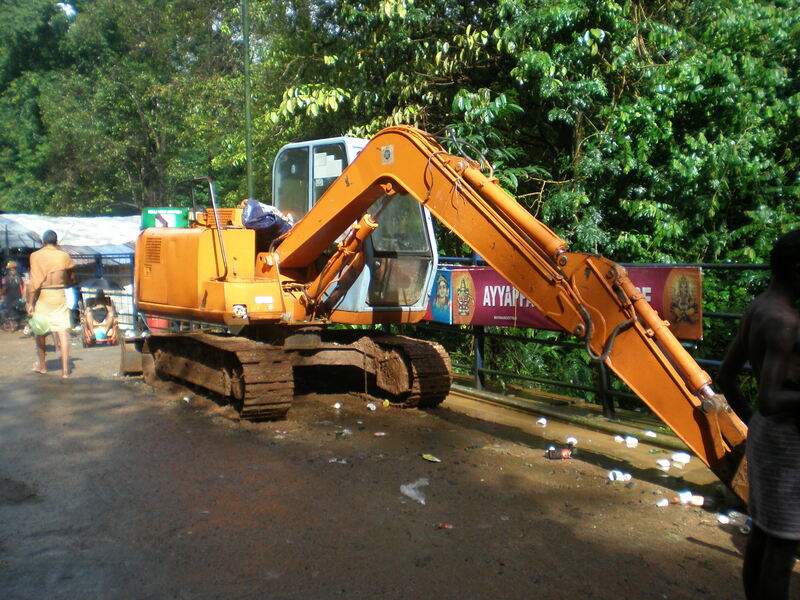 You can also now see huge earth moving equipment at work paving the way for new roads, connectivity,..
On the way there are sheds which have come up which provide for places to rest and relax a while on the way. Again on the way one could see very novel ‘urinals’ (sorry no picture) which have been put up to channelize the ‘human leaks’. Not sure hygienically if this is a good idea as the stench in the vicinity was unbearable 😦 Those days pilgrims would just disappear in the forest area to relieve themselves and Nature would take care of the rest. 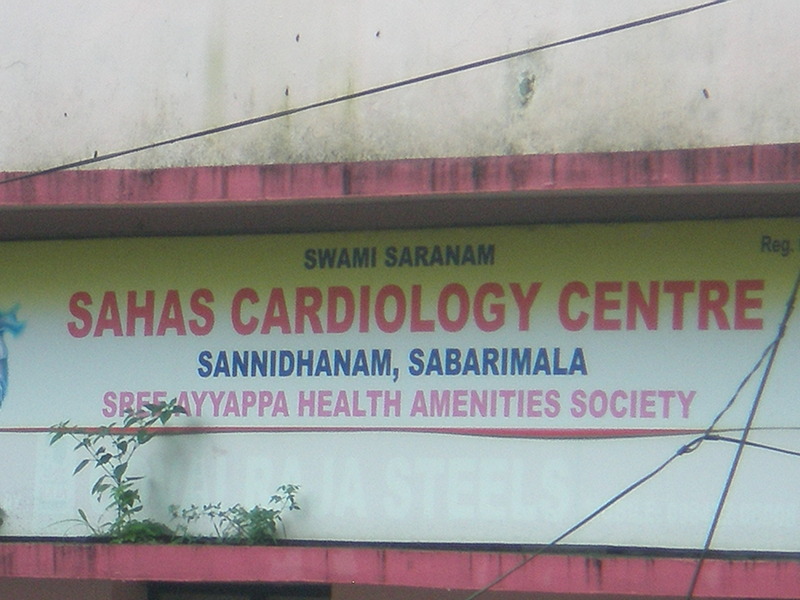 For many people an annual trip to Sabarimala is an opportunity to test their “cardiological well-being”. The steep climb up for a few kilometers does challenge the strongest of hearts. 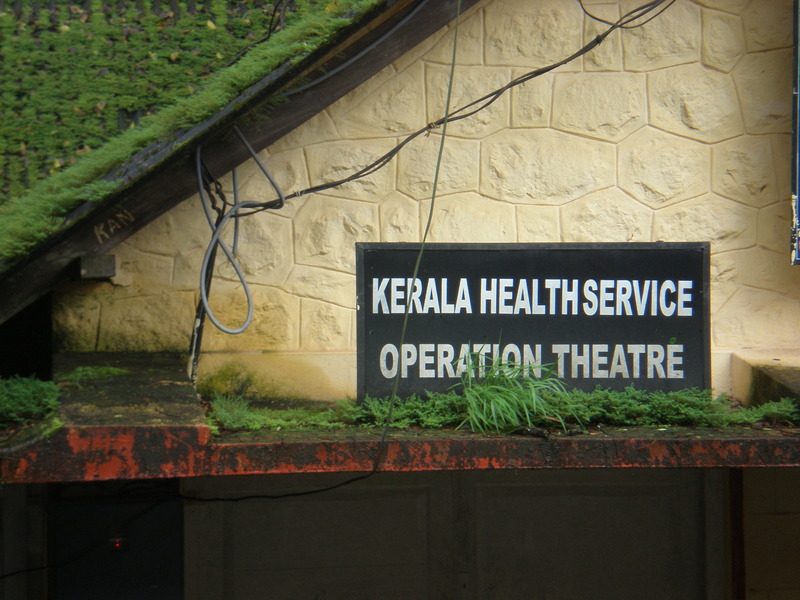 Therefore one is happy to see the mushrooming of health centres now at the base, on the way and at the top. So you now have a buffet to choose from – Ayurvedha hospital, Homeo dispensary, Cardiology centre and General clinic are all there in case of emergency. 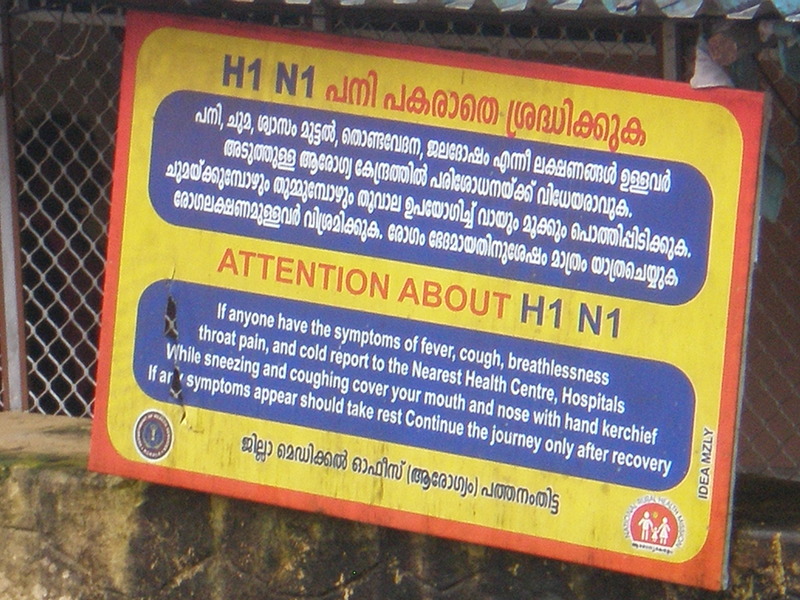 And as a sign of “globalization” – you can see warning signs on H1 N1 as well. At the Sannidhanam on top there are ofcourse many new crowd regulating measures at work but still I’m not sure if these measures really work during the peak season time when millions throng the place. You can only now climb up the “Holy 18 steps” and not allowed to use for climbing down. The steps are also gold plated now (so is the temple Vimana – Courtesy one Mallya I’m told 🙂 ) and you are not allowed to break coconuts on the steps now. With mobile phone connectivity till up the top, don’t be surprised to see mobile/ TAB toting pilgrims “checking in” and “checking out” of “Pamba / Sannidhanam’,… and updating status real-time on FB or tweeting about the weather. Also it has made the whole travel experience more convenient. So on your return with a few calls, you are spared of the trouble and time of locating your vehicle and the driver which used to be a nightmare before. As they say, “the more things change the more they stay the same”. Ergo there were so many things which remained same in 15 years – some thankfully so and some not so. The ones which remain the same thankfully for example the thick forest cover, very good roads in such an intimidating terrain,.. need mention. The sight of very poor and diseased people seeking alms along the way up the hills is something which you saw those days and you don’t want to see today. Obviously inclusive growth has been elusive in our country. 15 years is a long enough period for countries to lift people out of poverty as we saw in the case of China. But for our country, our administrators are still “Googling” for the magic formula and unfortunately we have not found one yet. It was the 29th of August, a day after people celebrated ‘Krishna Janmashtami’ with gaiety and religious fervour all over India. It was almost around 9 pm and I was flying back after a same day return business trip, obviously tired. I was lost in thoughts of the happenings around the Indian economy the last few days. The rupee had its worst fall in the last 20 years and nobody had a clue where it is heading to. The worst nightmares around India were coming true one by one. Finally India beat China – China was supposed to slowdown first but we beat China on this!!! On the flight for a change we were spared of the usual traffic congestion over Mumbai and we were promised a prior to schedule arrival. Closer to touch down, one could see the narrow streets of Mumbai lit up in sparkling Chinese lights, crowds gathered around some junctions and an overall frenzy. It just dawned upon me that on that day in Mumbai and may be in few other cities in India, the “Dahi Handi” (Curd pot) ritual was played with increasing vigour year after year. As per Hindu mythology, Lord Krishna as a child used to steal butter from earthen pots hung high from the ceiling of neighbours. The practice to emulate this has become an increasingly popular event in cities. The earthen pots migrated from inside houses to main roads, streets and housing complexes and Krishna’s surreptitious acts of theft have now become open opportunities for groups of men (called Govindas) to excel in broad day light in front of thousands and take home rich bounties chipped in by many a sponsors!!! As my cab took right from the Western Express Highway (yes, in Mumbai we call long stretches of road at times narrow, at times wide, with intersecting signals every kilometre, with slow inefficient toll plazas slowing down the traffic and with no concept of a hard shoulder to use in case of emergencies – as Highways and Express ones in that) the traffic congestion which we were spared of while on the sky came to haunt us with a vengeance on the ground. The traffic quickly graduated from being slow moving to “No” moving. I got out of the car and it took me just few seconds to realize that the battle between the “Govindas” and the “Dahi Handis” perched few metres from the ground was gathering steam and so traffic blocks be damned. I decided to let myself consumed in the atmosphere and observe what’s going on. I had not watched one in such close proximity before frankly. As I watched the proceedings I could draw few parallels between the Dahi Handi ritual and our country. The Handi I guess was suspended about 20-25 m high and I heard that the height varies from mandals and it could be even 40 m +. The chants of ‘Govinda ala Re and ‘Haathi Ghoda Palki Jai Kanhaiya Lal Ki’ accompanied by beats of the Dhol amplified the already noisy surroundings. It signaled the arrival of a group of Govindas all attired in yellow with sponsor’s logos (as is the wont nowadays) to take a shot at breaking the pot. They took a few minutes to size up the challenge and as the beats started hitting a crescendo they began the task of putting together the human pyramid. Expectedly, strong, taller men formed the base and layer by layer they built the structure. So far so good. With few thousands of people watching the scene with breathlessness some with jaws open like me, the tension was palpable. It was now time for the kids to be lifted up as the pyramid gathered height. The pace slowed now. One could hear many instructions going around. It was clear that these groups practiced collective leadership and were mainly driven by instinct. With just few meters away from the pot, it was time for the last part of the pyramid – a small kid may be 6-7 years of age to be thrown into the ring. The boy wearing a yellow protective vest (happy to see that but surprisingly he was the only one to wear that) slowly helped by many limbs, biceps and shoulders gradually made his way up. The cheers now get really boisterous. And as he reached the top and tried to balance himself – lo somewhere something went wrong and the pyramid fell apart and with it the hopes of the participants to hit the pot and jackpot accompanying it. It’s very difficult to pinpoint who did what and what went wrong. What happened immediately after this was interesting. Few seconds of disappointment later, the group recouped itself. Took a few minutes off breaking into a dance to ‘Sheela Ki Jawani’ and goading chants and went for the 2nd attempt. Ironically they didn’t manage to break the pot in that as well. When the crowd withered away, we got some leeway and got out of the spot. Another group may be in a red uniform might have come next. They also might have given a crack at the pot. Might have failed once and may be finally accomplished on the 2nd or 3rd attempt. The 1st yellow group forgetting the experience would have moved on but with renewed energy to the next mandal and hopefully succeeded there. Unfortunately our approach to managing the economy and achieving growth rates is eerily similar. The breaking of the pot is similar to the GDP growth rate India can achieve. Just like the different heights of the pots it can be 6 %, 9% or whatever. Just like different groups trying to hit the pot, there are different groups working in different areas to make the economy grow and hit a GDP rate figure. The target may be 8%, 9%,.. in the beginning of the year but only at the end of the year depending upon the height of the handi we will know if we have hit the same or not. Though we want to grow there is no structured plan or strategy which is put in place. We just hope that the consumption fuelled by our great growing population or economic growth in the developed nations will use more of our products and services and propel our economy. That’s the reason why our economy grows one year at 7 %, few years at 8%, drops to 5% and so on. If the GDP target growth rate is achieved, everyone is happy, plenty of jobs are generated, billions of FDI comes in, stock market booms, realty picks up,.. ,.. and there is happiness all around. On the other hand when the economy doesn’t achieve its growth, and goes down, it drags with it thousands of people who lose jobs, have to take pay cuts,.. like the hundreds who end in hospitals the next day injured. But is there a major despair?? No. Just a bit of disappointment and people just shrug off and continue their day to day work hoping to contribute to a better growth next year. In governance too there is no leader but something called a collective leadership which essentially means no accountability. In the whole process of driving the economy, politics, government policies and corporates all play their part – sometimes helping the cause and (as we see these days) at times hampering the cause. On the day when rupee depreciated close to 2 rupees to a dollar, there was panic and gloom in the corporate board rooms as reported by pink papers. But not on the streets. 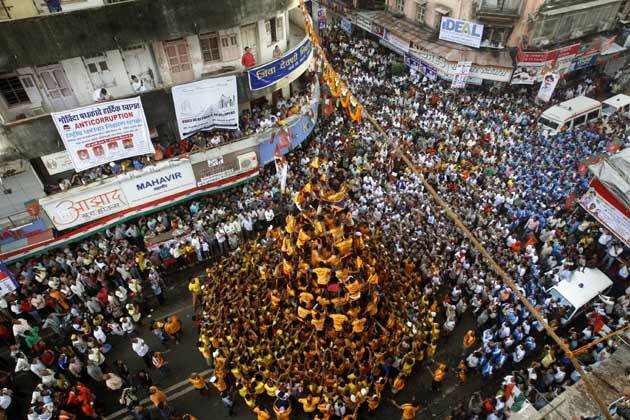 The Dahi Handi was going on in usual raucous fashion. So that is India. We have our own way of balancing our lives by shrugging off our woes and still moving on in life with fun and revelry. The festival season has just kicked in. Janmashtami was just the start. Tomorrow is ‘Ganesh Chaturti’ – a time to chant “Ganpati bappa morya’ and forget what’s happening to our Rupaya!! !